If you’ve ever enjoyed the cult cartoon comedy television show that’s based in the Colorado Mountains, then look no further and prepare yourself for an adventure of a lifetime in the comedic-themed slot South Park. Developed by NetEnt, you will join Stan, Kenny, Cartman or Kyle while adventuring through this small town. The game is designed in a 5 reel, 25 payline format with bonus features that include wilds, sticky wilds, re-spins, bonus multipliers and bonus games. The background perfectly represents the cartoon show with bland white snow, bleak green trees and simply designed mountains. NetEnt focused on perfectly recreating the show, meaning the characters look identical. Kyle, Cartman, Stan, Terrance, Phillip, Mr. Hankey, Kenny, and Ike are the characters joining this production as are the A, Q, K and J displayed in a south park manner. The betting options can be set to individual preferred playing style and coin values being adjustable between $0.01 and $0.50 as can the bet levels. The minimum bet starts at $0.25 whilst the maximum for a single spin is $250.00. You can choose to also access the autoplay feature where 10 through 1000 spins may be selected. There are numerous wild symbols in South Park. The regular wild appears on any reel in the main game and during the Kyle Bonus Spins. It will substitute for all symbols except for those responsible for activating bonus features. Two regular bonus symbols appearing on the 3rd and 4th reels whilst one of the character symbols are displayed on the 5th reel will activate the bonus game. The bonus game played depends on the character seen and includes the Cartman bonus game, Kenny or Kyle bonus game and the Stan bonus spins. The Terrence and Phillip mini feature randomly placed three wild substitutes on the 2nd, 3rd or 5th reels. These three wilds will replace the symbols on the reels to award payouts. The Mr. Hankey mini feature, just like Terrence and Phillip, is randomly awarded and will place three to five wilds across the 1st, 3rd, and 5th reels. The Cartman mini feature is randomly awarded, acting as a 3x3 block of wilds. This is the beefcake wild, which will appear on the 2nd, 3rd or 5th reels. It substitutes all regular symbols, awarding a sequence of payouts. Kyle Bonus Symbols is activated when the Ike wild is on the center position on the 5th reel. This will have users awarded with ten free spins. During the ten free spins, a multiplier up to 10x will randomly be activated and fall onto the reels. If Ike reappears, three free spins will be rewarded. Players will guide Kenny through three separate zones. The zones are listed as the Win Zone, Multiplier Zone, and Danger Zone. The win zone contains numerous coin prizes, the multiplier zone has various multipliers and the danger zone has one secret trap that needs to be avoided. Simply select one of the three highlighted zones to start the bonus game. The Cartman Bonus game has four randomly generated outcomes including coin prizes, multipliers, resets and the warning symbol. These outcomes are revealed by clicking on yellow clouds. This can award 750 coins as the coin prize once the singers are revealed in the clouds, up to a 2x multiplier can be randomly generated if the husband and wife are seen behind one of the clouds and the bonus game can be reset when the rocker is revealed by clicking on a cloud. Sticky Wilds are available during the Stan Bonus Spins. The sticky wild will appear in the center position of the third reel. It will remain in that position for two spins, causing for numerous prizes to be won. South Park is a high-paced experience featuring simple graphics, extensive gameplay and numerous features that lead to balances being in the positive instead of the negative. The bonus features are of a high volatility level, meaning payouts will be of a high value but triggering the features will be hard to accomplish. Once the features are unlocked, the true profitability of this NetEnt designed game is revealed. Hours of fun will be had in this game. 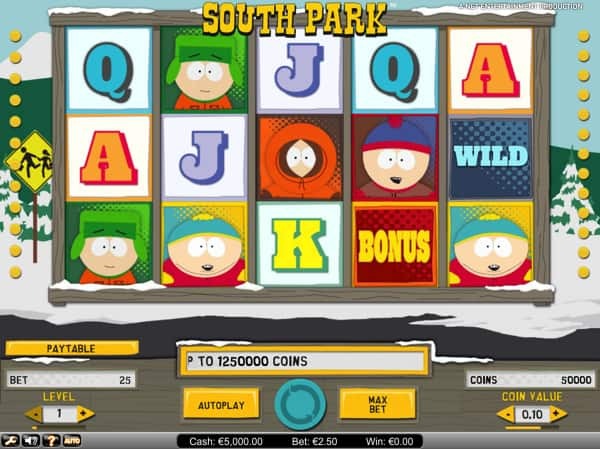 We have embedded a demo version of the South Park slot so that you can try it out for free.